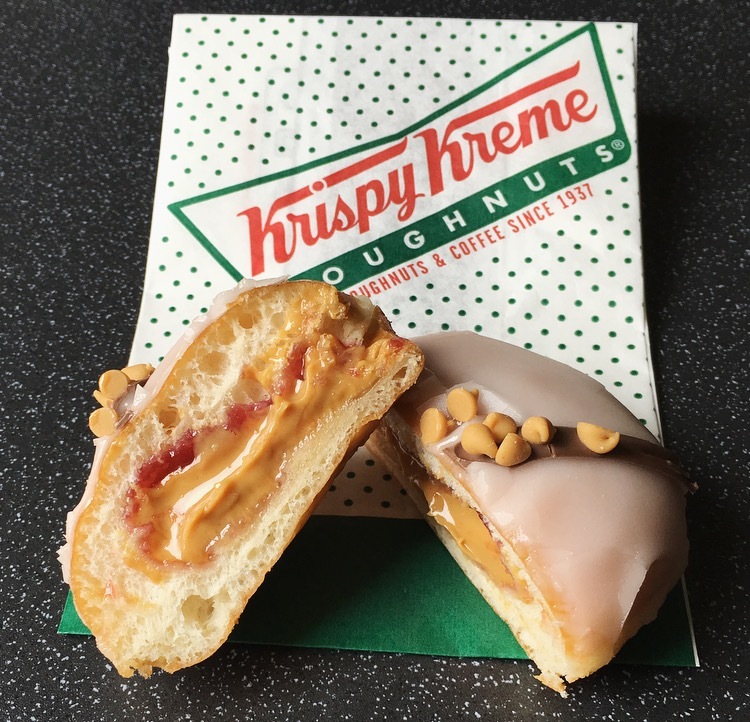 Being the peanut butter addict that I am I couldn’t not try a certain new doughnut on the block and at the weekend I finally got my hands on the New Limited Edition Krispy Kreme Reese’s Peanut Butter & Jelly doughnut. This is the third in the family of Krispy Kreme Reese’s doughnuts and it joins the original Reese’s Peanut Butter and the Reese’s Peanut Butter Crunch. I did wonder how long it would take Krispy Kreme to combine peanut butter with jelly, aka jam filling given it is such a classic combination. So with that said lets get on with things. I picked this little beast up for £2.00 from the cabinets in Tesco, which seems to be slightly more than the other filled doughnuts. I was also a tad confused by the icing on top. Last I saw and read the Krispy Kreme Reese’s Peanut Butter & Jelly doughnut was with the classic glaze not this, which made me second guess myself as to whether this was even the new one! As always I wished for more peanut butter drops, there really isn’t enough to make an impact, what I really want is a top filled with drops. Slicing open look at that bursting at the seams filling we have going on there! Finally a Krispy Kreme doughnut that has a decent amount of filling!! The doughnut itself was the beautiful soft, fluffy doughnut with a bit of stodginess that we have grown to love and expect from Krispy Kreme. 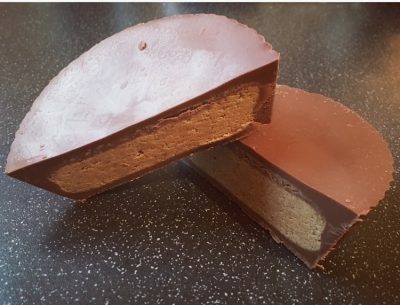 The mix of Reese’s peanut butter and raspberry jelly was nicely balanced, and the sweetness from the jelly offset the saltiness of the peanut butter. The filling was a lot looser than the original Reese’s doughnut but thankfully not runny. 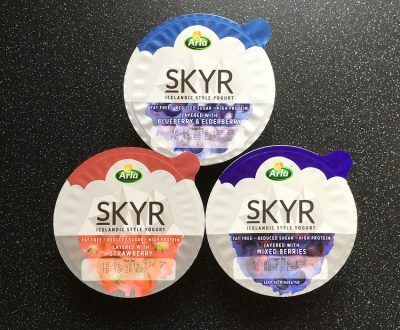 Depending how much of each you got in your bite determined the dominant flavour, personally I liked that little more peanut butter flavour over jelly flavour. Now my bug bear with this doughnut is the glaze, it in no way complements the salty peanut butter and fruity jelly and throws the flavours into disarray. Why oh why have they put a vanilla glaze on top when it should be the Classic Glaze? Last time I checked the classic did not taste vanillary, either someone is doing this for a laugh or there has been one major screw up! The Krispy Kreme Reese’s Peanut Butter & Jelly is a nice edition to the Reese’s family even if it is for a limited time. Of the three this is my second favourite, first being the Original which had a nicer peanut butter flavour and consistency. If it wasn’t for the vanilla glaze on this PBJ I would be giving it top marks. After conversing with Krispy Kreme they confirmed it should be a Classic Glaze, not vanilla and would be looking into, so I shall await to see what they say! If you happen to spot one without a white vanilla glaze definitely give it a whirl. If you have had the new edition I would love to know your thoughts. 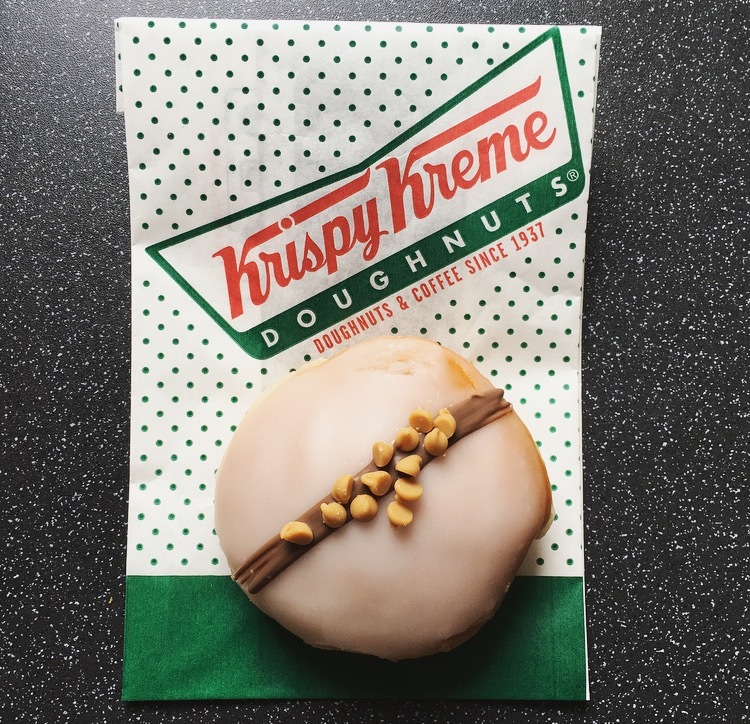 In the meantime if you are wondering what the new limited edition Nutella one is like, skip on over to my Krispy Kreme compadre Reaching For Refreshment. I had one the day after they were released and it was just the standard glaze – weird! I wonder if the ‘baker’ got confused.